This mountain is considered ideal to adjust to the altitude and is good for beginners. To reach this mountain will have to go through the ravine on the way to Llaca and we will appreciate the mountains such as the Huascaran (6,768 m), Hualcan (6112m. ), Ranrapalca (6162m. ), Chopicalqui (6354m.) and others. We leave from Huaraz to Llaca Valley and on the way we see the mountains of Ranrapalca and Ocshapalca. We also have a beautiful view of the mountains of the Cordillera Blanca and Huaraz. 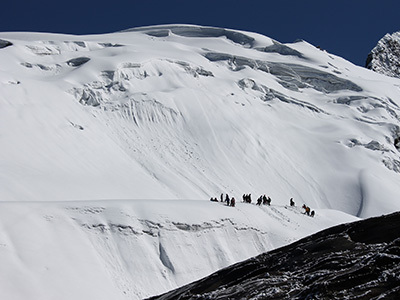 We leave very early for the summit to reach the peak called Vallunaraju (5675m) where we will see beautiful views of the mountains of the Cordillera Blanca and Huaraz. Then we descend to our campsite and return to Huaraz.